Analyst Michael Pachter thinks that Call of Duty: Black Ops will struggle to surpass its predecessor, unless the gaming press gives it a break. 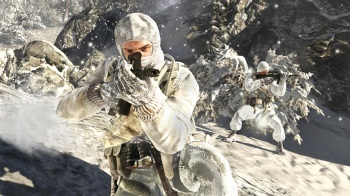 Pachter has accused the videogame press of being hypercritical and bitter when it comes to Treyarch's entries in the Call of Duty series, and thinks that Black Ops sales will suffer because of it, despite all evidence suggesting that the level of interest in the game has outpaced that for Modern Warfare 2. In order to be successful, Pachter says, Black Ops will have to overcome two big challenges. First, it will need to find a way around the videogame press' bias against Treyarch. Second, Pachter thinks that Black Ops will be marked down because it isn't Modern Warfare 2. Pachter says that the press unfairly looks at Treyarch as the "other" Call of Duty studio, largely playing second fiddle to Infinity Ward, and points to lower average review scores for Treyarch's efforts than for IW's. He also thinks that the press will take every opportunity to make unfavorable comparisons between Black Ops and MW2, as it did with the recent reboot of Medal of Honor. Pachter believes that if Black Ops manages to get an average review score of 90 or better, it stands a chance of selling better than MW2, but says even if it does get a high score, the competition from Halo: Reach, Medal of Honor and Vanquish means that that chance is small. Assuming that Pachter is right - and that's a pretty big assumption - I think he rather overestimates the impact the press has on videogames sales. Some analysts, notably EEDAR's Jesse Divnich, think that it's marketing helps people decide where to spend their money, not reviews. You only need to look at Medal of Honor selling more 1.5 million copies in less than a week to see that unfavorable comparisons to Modern Warfare 2 and lukewarm reviews aren't necessarily a death knell for a game. Pachter's comments almost sound like those you might find coming from a fanboy on a forum, making excuses about why his favorite game didn't score as well as a rival. Everything he assigns to biased press can be explained much more simply. For better or worse, Treyarch is the other Call of Duty studio, because the series started with Infinity Ward, and the lower review scores might be down to bias, but it's more likely to be because the games weren't as good. There will almost certainly be a few reviewers that will give Black Ops a hard time just because Treyarch made it, but there will be plenty of others who are excited about game.